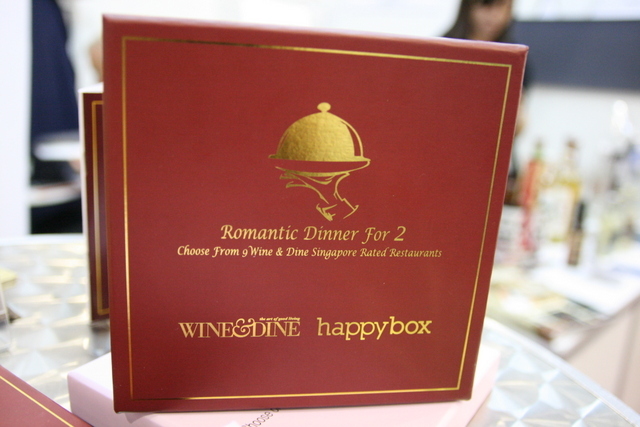 Giveaway: Wine & Dine Happybox Romantic Dinner for 2! Making people happy one box at a time - that's Happybox (see Facebook page). 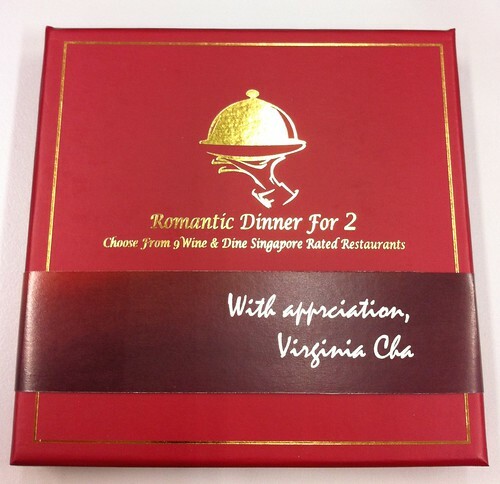 The Wine & Dine Happybox "Romantic Dinner for Two" (S$169) is a gift product that allows you to choose from nine restaurants to dine at. Right now, the restaurants include Min Jiang at One North, Anar, Indochine, The Cathay, Bodega Y Tapas, Brasserie Wolf, Pavilion Restaurant, Esmirada and Kiraku Japanese restaurant. You can check out my review of Anar here, and Brasserie Wolf here. Inside each Wine & Dine Happybox, recipients will find a gift card valid for a dining experience for two, and a full-coloured booklet of all the participating restaurants, and what's offered. The meal is usually three courses or more, and often exceeds the value of the gift card. You can see all the menus and partners online. This gift is suitable for all occasions and the best thing is - it takes the guesswork out of the giving. And the recipient gets to choose the experience he or she likes, so it's less likely that the gift will be stashed away unappreciated in some cupboard or worse, regifted. The freedom to choose means it's win-win! Here's how it works after you give the Happybox: The recipient validates their gift card online, and then picks one of the packages offered in the booklet and makes reservations directly with the restaurant. Upon arrival, they present the Happybox gift card and proceed to enjoy the romantic meal. Buying a Happybox is easy. You can pay online via Paypal or Internet banking or call +65 8353 8264 to order. Corporate packages or bulk discounts are available. Customization of gift boxes will be launched very soon. You'll be able to add personalised sleeves, a gift card specially printed with the recipient’s picture with a personalized message, or other interesting customizable items into each gift box, to complement the gift card and guide book that is already in each Happybox. That sounds cool. Call +65 8353 8264 to get your own customization done (additional charges apply, of course). They also offer a Beauty Delights Happybox (S$59) offering pampering deals from 17 partners and over 29 experiences ranging from massage to facials to tanning and nails. The concept is the same, just that the gift is a lovely experience involving health and beauty. Check out the website to see the partners and offers. With Father's Day round the corner, the Wine & Dine Happybox might be a gift that makes dads happy. This is also good for birthdays, anniversaries, festive seasons, and even as a gift of appreciation or reward. 1. Tweet this post or link to this post on your Facebook, and give me the URL(s) in a comment below. 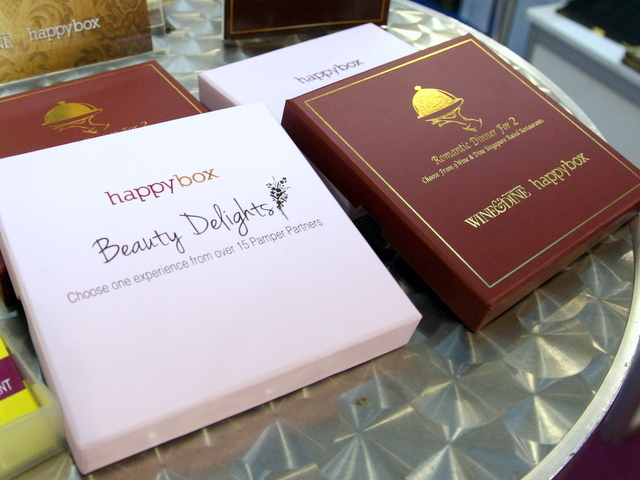 Lemme know which Happybox you are interested in! 2. SHARE the entry on my Facebook fan page for a double chance at winning. Just say which Happybox you want to win! e.g. "I want to win the Beauty Delights Happybox!" I will pick the winners randomly at 10pm on 8 June 2012, and I look forward to making two people very happy! I have also shared shared entry on fb page for double chances! I would love to win Wine & Dine Happybox "Romantic Dinner for Two"
I have shared the link on my facebook. I have also shared the facebook page! I would love to win the Wine & Dine Happybox gift! I would very much love to win the Wine & Dine Happybox gift, please! I would like the Wine & Dine Happybox please! I have tweeted this post via https://twitter.com/#!/TanGavin and link to this post on my facebook via https://www.facebook.com/tangavin and SHARE the entry on your facebook fan page to multiply my WIN. Definitely want the Wine & Dine. I've been wanting to go to Min Jiang for ages. I would love to win the Wine & Dine Happybox Romantic Dinner for 2. I would love to win the beauty delights happybox, can share the beauty bliss with my sister! I'd love to win the Wine&Dine Happybox please! Thanks for sharing this great happybox! Liked your Facebook paged, and shared the post from your Facebook page too. I love to win the Wine and Dine Happybox Romantic Dinner for 2. Hope to give it to my dad as a surprise Father's and birthday present. I hope you can make my family and myself happy! I have tweeted and shared this giveaway on Twitter and FB. I have shared my entry on your Facebook wall. Thank you and look forward to hearing from you soon! Thanks for this beautiful give away to your fans Camemberu. I hope to win. Liked your FB fanpage & shared the post on your fb wall too.. I would love to win the Wine & Dine Happybox so that I can take my better half on a romantic dinner date :-). I would love to win the wine and dine happy box! I wish to win the Wine & Dine Happybox! Hoping for a romantic dinner for 2! HOPING TO WIN A HAPPYBOX DINING FOR TWO! I posted the link to the Camemberu give away on Facebook. Please find link below. I wish to win the Happybox dinner for 2. Fingers crossed!!!! 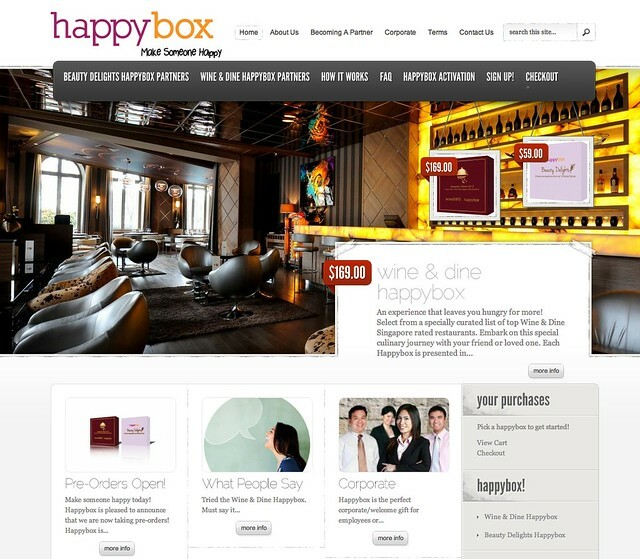 I would like the Wine & Dine Happybox! Hope to use this for my birthday ! I would love the Wine and Dine Happybox. My Facebook Name: Ferlin Kim. I want to win The Wine & Dine Happybox "Romantic Dinner for Two". I want to win "Romantic Dinner for Two" Happy Box! Going to Sydney on Scoot's Inaugural Flight!